BillHustonBlog: "Binghamton University has been BAITING the DEER for YEARS"
"Binghamton University has been BAITING the DEER for YEARS"
BAITING the DEER for YEARS"
(Vestal NY) -- "Binghamton University has been baiting deer for years." proposed slaughter of 90% of the herd which live in the Nature Preserve. to do it? It's like they think they are above the law." is even named, "Anthill Trail". There's just one problem with that. 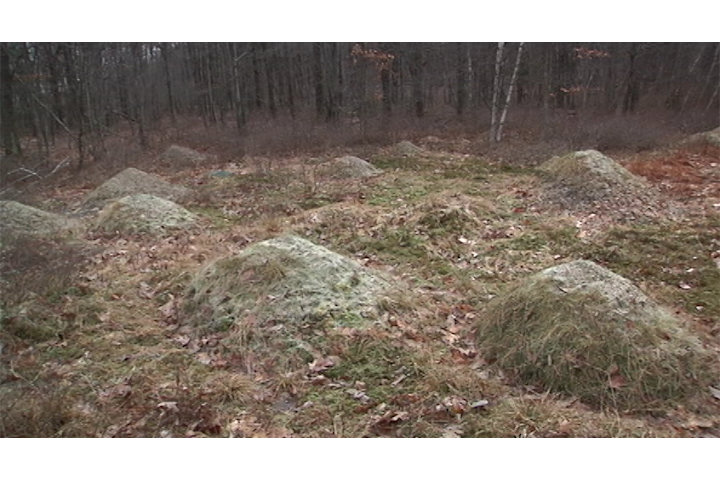 PHOTO: Some of the dozens of giant 3ft tall "anthills"
So, if they aren't anthills, what are they? from the plant nursaries", Tompkins told Friends of Nature and Animals. 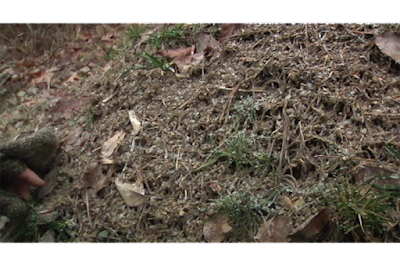 "I can't reveal my source, but they use a machine called a 'Goat'"
to turn food waste into mulch, then dump it up here. The deer eat this, it's like bait to them", he continued. animals had eaten away at the top of several of the mounds. "If the deer are overpopulated, it's BU's own fault". If anyone wants to see more mounds like the ones described in the Nature Preserve, please take a walk through city land at the top/end of woodland here on the South Side. 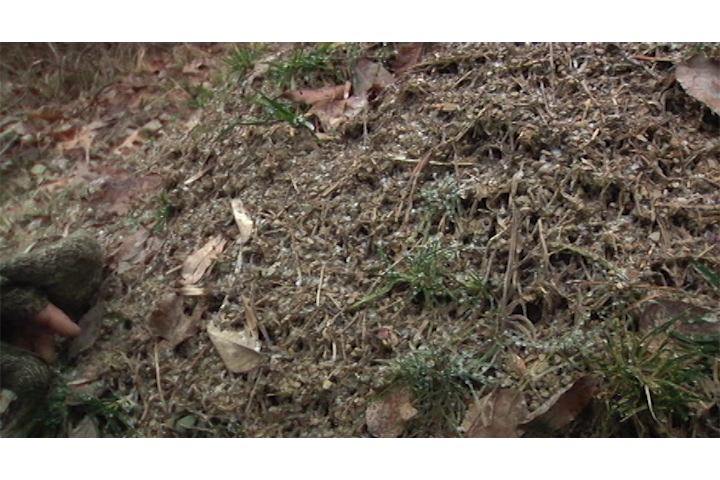 Or walk the paths on South Mountain to see some dense collections of the ants. I film the ants when active in the summer and use them in my biology classes. It amazes me how anyone who spends time outside in the local woods can fail to have seen them, covered with workers. 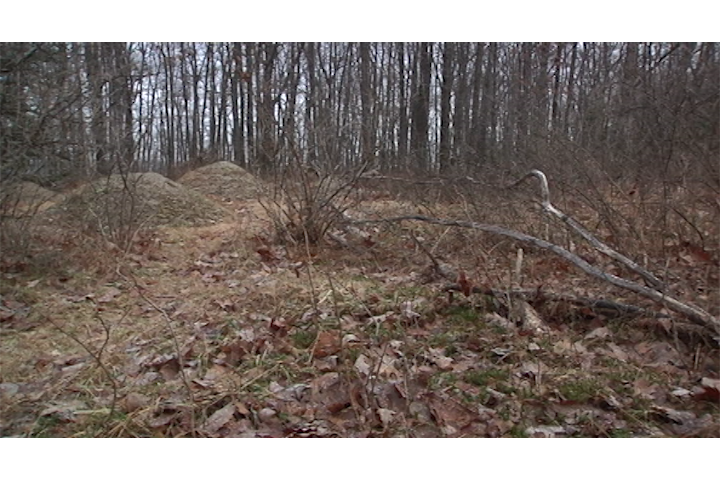 The mounds go through a cycle of being built and used while the workers harvest nearby vegetation and other foods, then they shift to new mounds, leaving these to gradually deteriorate. Thanks for the feedback, Anne. I am just tracking down every lead. I was told these mounds were dumped compost from the cafeterias.